Want to quickly see how the open-source software Zenphoto works? You'll find a free and updated demo installation of Zenphoto here. Zenphoto CMS is a standalone CMS for multimedia focused websites, designed to be particularly easy to use while providing all the features you might need to manage your website. It offers great support for images, audio and video files and was created with a specific audience in mind of business professionals. Some examples include illustrators, artists, designers, photographers, filmmakers or musicians. Zenphoto CMS has a great community and you can join their forum discussions, get involved in the community and contribute to the project even if you’re not a programmer, or easily report any bugs you might find. However, the list of Zenphoto CMS features doesn’t stop at media support. 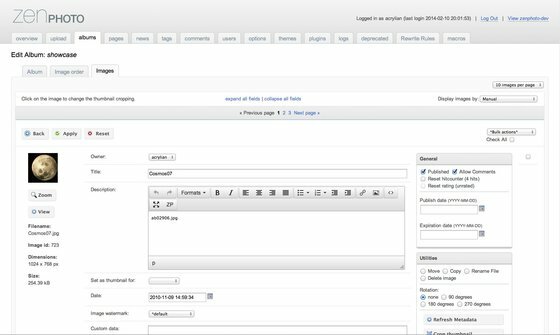 You can also create custom pages, including nested subpages you can manage using tags, and enjoy a fully integrated news section that will help you easily manage your blog, schedule publishing and enable comments. 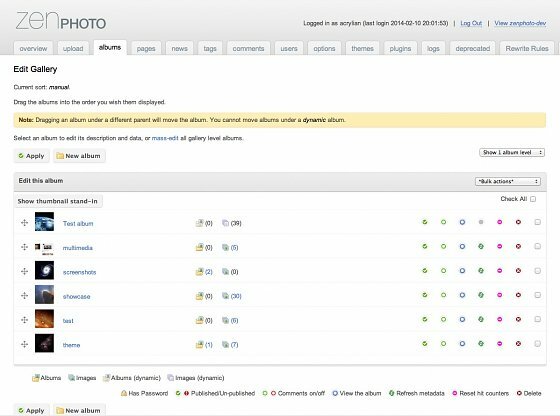 Other features include multi-language support, user management and password protection for albums and pages. If you login to an admin demo you’ll see the backend is translated to multiple languages like Chinese, Dutch,German, French, Japanese or Spanish, turning it into a user-friendly CMS for people around the world. The screenshots below give you a preview of the admin area, showing how easy it is to manage your media galleries and create new albums. If you’re interested in a full review of this CMS, download it, go through the installation process and create your own Zenphoto online demo. You’ll see there are five default themes available, or you can choose from different themes created by third-party developers. To customize the appearance of your website, Zenphoto also makes it easier to create your own themes. 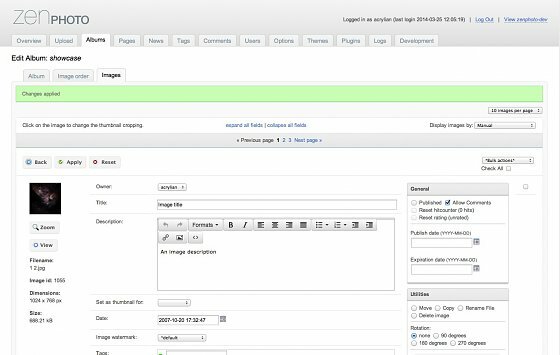 If you want to extend the Zenphoto features you can use the plugin system and install third party plugins that will enhance your website and provide extra functionality. The latest Zenphoto version, 1.4.14, was released on January 28, 2017 under the GPL v2 license.